Until recently, meaning until I went to see Hussein Chalayan’s exhibition at Istanbul Modern Museum, there were only three things I knew about him. I have heard his name for the first time in 2000, with his “Afterwords” project which I hadn’t known the name back then, and have identified him with his table-skirt. Then, in 2005 I had the opportunity to meet with him once again because he was representing Turkey at the Venice Biennale and his name was very quoted in the media. Our last encounter was during the promotional advertisements for the launching of Vogue in Turkey, whereas his voice saying “I think Vööög is” (with his pronunciation of Vogue) became an attraction of most of the Turkish people (there’s no such thing as bad advertising). After his exhibition at Istanbul Modern, I adopted a very different regard towards him. Chalayan is not only a much appreciated fashion designer in the international arena, but I believe that he is one of the most successful critical artists and thinkers of our time (and probably that is also the main reason why he is so appreciated). Hussein Chalayan brings together architecture, technology and music with fashion and clothing to make them transportable. In this piece, I will not be focusing on his fashion designs but especially his art projects, which will be read in the lens of transnationalism, immigration and hybridity. So I’m warning from the beginning: this maybe a boring reading and if you do not want to read all of it you can just read the summary in italics which is at the end of this piece. Turkish Cypriot by origin but English by his settlement, multiculturalism and with it identity hybridization comes to the fore in most of Hussein Chalayan’s work. The hybridity concept that has derived from biology, argues that the globalization does not simplify cultures to a unique one, but rather gives rise to new cultures. In his 2002 Fall/Winter collection, “Ambimorphous”, this hybridity reflects to his clothing, and the patterns which are ethnic cultural elements gradually “evolves” through modern clothing but do not disappear and make a comeback at the end of the show. In this way, the artist probably shows that what we perceive as “modern”/global is not actually so different from the traditional/local, and each are mutually inclusive. On the other hand, Hussein Chalayan does not define the fashion as a means to representation just based on design. And so he does not only go beyond Turkish designers who have gained international recognition but he also challenges the global fashion community and brings a new look at it. In his arts projects he represents clothing as private properties, archeological talismans or identity elements (DNA). The artist’s positions people and his cloths in the framework of mobility in the triangle of Cyprus-London-Istanbul and in his own fictionalized and extraordinary worlds he tests the moments of encounter, conflict and hybridity of different identities and cultures. In this respect, we need to talk about the “Afterwords”, which is perhaps the most impressive and best-known work of Hussein Chalayan. In Chalayan’s website, Afterwords is described as such: “Afterwords was inspired by the horror of having to leave your home at the time of war. Initially Chalayan took the inspiration from how Turkish Cypriots (including members of Chalayan’s family) were subjected to ethnic cleansing in Cyprus prior to 1974. In this light a living room was created where clothes were disguised as chair covers, suitcases as chairs and each object in the room fitted into a special pocket which was specifically designed to contain them”. 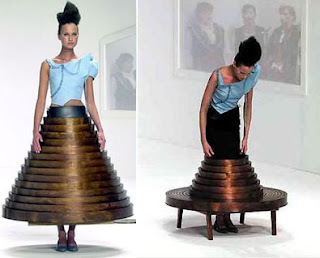 The creation that includes the famous table-skirt, the artist designs the clothes as portable private properties, and so the individuals can carry these items that define their identities and cultures with them when they are subjected to migration due to various political circumstances. Here, the clothes go beyond their original functionalities of covering or protection and their new main function becomes logistical. In the end, they help shaping our new becoming culture that would be embedded to the new society. Another impressive work by Chalayan is his piece that represented Turkey at the 51th Venice Biennale. In the movie of “Absence Presence”, artist starts from the paranoia of terrorism and tackles to the immigrant and refugee policies of the British Government and considers the adaptation issue of the immigrants. In the movie, non-British women are asked to donate their clothes to a biologist. The biologist examines the clothes and the DNAs in order to examine the sound map of London, and measure the reactions of each individual to his/her surroundings. In the end, the biologist realizes that she will never understand the real identities of the people in the world because there is a constant movement and cleanses herself to escape from this knowledge. Whereas in the Afterwords the clothes were representing what is outside, in Absent Presence, they include what is inside, or in other words our DNA and identities. With this study, it is possible to know who we are, what we do, how we react according to clothes; and this is not a matter of designing of the clothes but because they are biologic parts of ourselves. Once again we encounter hybridity in a way presented in the post-colonial theory and the thinking of Homi Bhabha. We encounter the fear of colonizers, who feel themselves as the key authority but at the same time afraid of the “others” (in this case non-British women), will not be assimilated in their own cultures but impose their own cultures on themselves. The fact that the biologist tries to cleanse herself from the knowledge of no pure identity in the world shows that in fact there is no actual pure self in the world, because we are all hybrids. Two other works that I will briefly present of Hussein Chalayan can be given as examplesof temporality and movement phenomena. In Temporal Meditations, we see people who eat raki while eating watermelons or play backgammon on a tea tray. The artist shows the past and the future according to migration paths, and the clothes or garments in the movie become a sort of talisman. In Place to Passage, he describes a woman who travels alone in a technological boat, and the loneliness of displacement is considered in the movie. I tried to approach to a part of Hussein Chalayan’s work and only in a superficial manner. I believe that a lot of work needs to be done on his projects with regarding to hybridity, transnationalism and also technology, temporality and musicality. In this way, maybe we can observe better the encounters of the Turkish society with the west, and understand the conflicts, fears and solidarity, clasping together and hybridity of both sides.